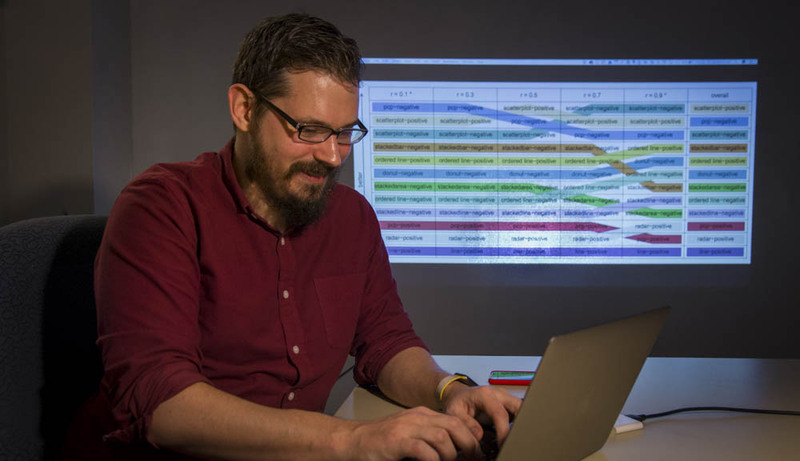 Computer science professor Lane Harrison knows his work might not make an impact on society for several years, but he also knows it will make a difference and that motivates him. Lane Harrison’s scientific understanding of data visualization helps him explain the information presented by big data by bringing it to life with visual patterns and trends. When I was an undergraduate, I wanted to become an actuary or work in computer graphics. One day I attended an on-campus symposium on data visualization, which showed me that you can use graphics to visualize data to empower people to understand complicated problems. I knew then that data visualization was something I wanted to explore further. That we sit in an ivory tower, ignoring the struggles people are facing in the world. Many scientists come from working class families and are actively working to make a difference, even if the impact won't be felt until many years in the future. I study how people interpret and interact with data visualizations. ...failed a class in college. Data, collected and analyzed with integrity, can be a starting point for discussion among opposing worldviews, and I want to ensure that everyone has equitable access to it. WPI's unique project-based curriculum, particularly the IQPs and MQPs, are an ideal mechanism for integrating students in the data visualization research our lab is doing.